If TV shows are hard for me to keep up with, can you imagine cookbook releases? :D Every time I take a look at the new cookbooks on Amazon I feel so far behind – and I’m not even talking about books that were released long ago but I still want anyway. This is a delicious and very easy cake from Food52 – the website. Now I can’t wait to try the clementine pound cake, too. Position rack in center of oven and preheat to 180°C/350°F. Generously butter a 21x11x6cm (8½×4½×2½in) metal loaf pan – I used a 22x12cm (9x5in) pan . In a large bowl, whisk together flour, baking powder, and salt. In a small bowl, whisk together maple syrup, sour cream, eggs, sugar, vanilla, and lemon zest. Add to the dry ingredients and whisk to incorporate. Fold in oil gradually until the batter absorbs it. Pour batter into prepared pan. Place pan on a baking sheet and bake until risen and golden and a tester inserted into center comes out clean, about 50 minutes. Cool cake in pan on rack 5 minutes, then carefully unmold onto rack. Turn cake upright on rack and cool completely. - have just bought 4 jars of Maple Syrup and have some sour cream in the fridge! Perfect :) ! What a pretty cake and what a pretty cake plate! 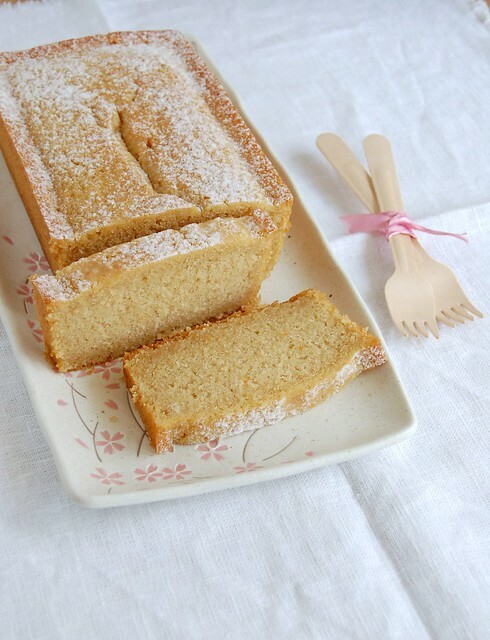 Oh a maple cake sounds like just what I need in my life... lovely as always! Yum, looks delicious and unique. Thanks for sharing.